Every now and then I come across a wall or a garden boulder that’s so beautiful I have to take a picture. Such was the case with this serpentinite specimen on or around Huntington Street. This is near Oakland’s great serpentine patch, and it likely came from there. This entry was posted on 1 August 2014 at 4:36 pm and is filed under Oakland serpentinite. You can follow any responses to this entry through the RSS 2.0 feed. You can skip to the end and leave a response. Pinging is currently not allowed. I know it’s not in Oakland, but there’s some good outcroppings of serpentine along Highway 35 and Cañada Road along Crystal Springs reservoir. Yes, that’s a fantastic locality, much more extensive than what we have. 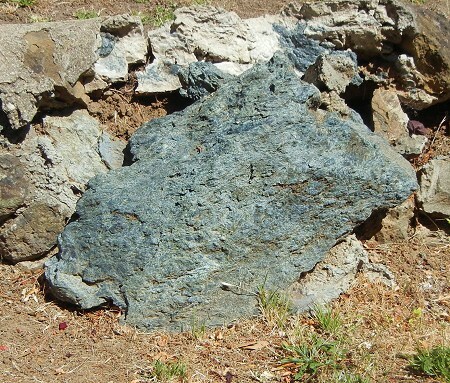 But all the features you can observe over there are present in our serpentinite too.